"There is a long list of potential cat skin problems, with diagnosis started by eliminating the most obvious or common causes such as flea allergy or atopic dermatitis (seasonal allergy). During a physical examination, Veterinarians will first try and classify the skin problem based on its appearance. A vet will be able to immediately spot issues such as fleas. If the answer isn't obvious, the vet will take a skin scraping to check for mites, a skin cytology (examination under a microscope) to check for any cat skin infection, and a fungal culture for ringworm, which takes 2 to 3 weeks to get results. If parasites are suspected, a parasiticide will be recommended . If these tests do not indicate the cause, a vet will start to suspect food allergy or will take a skin biopsy/sample for additional diagnostic lab tests. Cats that are able to absorb nutrients from a quality diet usually do not suffer from a cat skin food allergy. Cat skin lumps and bumps or lesions (problem area on the skin) tend to fall into certain broad categories, which helps with the diagnosis (see pictures below). If multiple cats in the household are suffering from similar problems, then a contagious disease will be considered. Treatment is ultimately based on identifying the underlying cause of the cat skin condition. Mild conditions with just itch or flaking can be treated at home. If you see additional symptoms such as hair loss, behavior change, fever, pus or oozing lesions, see your veterinarian." When investigating cat skin problems, start with simple explanations and then move to those that require veterinary tests (although it never hurts to visit your vet). For mild cat skin itch and flaking with no other symptoms such as pus or oozing lesions, fever or significant hair loss, try a mild non-medicated shampoo or waterless bath wash (see below for recommendations). In terms of a cause, first suspect fleas, even if you don't find any, as an early flea infestation is hard to spot and can cause problems. Cat flea symptoms include red areas, scabs and cat hair loss. When checking for cat fleas, pay attention to areas of the body such as the spine, neck and under the chin. For fleas, you'll need to eliminate them from your cat via a herbal treatment (see below), and then use a preventative such as Frontline Plus. If fleas are not the problem, you can try one of the medicated shampoos mentioned below. If the condition worsens, hair loss continues, you see changes in behavior, other symptoms such as pus filled pimples etc, then visit the veterinarian for some preliminary tests and evaluation (see below for tips on diagnosis). Be sure to always check your cat for any skin lumps, bumps, scabs, red skin areas, or anything that looks abnormal. To get an idea of what could be troubling your cat, review the pictures below, and click on the related links to learn more. Try searching our site and looking at the bottom of this page for questions submitted by readers that are similar to your concern. Each question was answered by our veterinarian. Also you can ask our veterinarian a question here about cat skin problems and receive a response for free. We receive many questions, so if you need immediate help, you can try this online veterinary service that has vets available 24 hours a day. Use these pictures of descriptions of cat skin problems to identify or eliminate possible feline skin diseases. Macule: A macule is a area of the skin where there is a change in color. Common causes are some type of inflammation or injury. Papule: A papule is a type of lesion that is elevated. If it is large it is called plaque. This type of cell inflammation is commonly called a neoplasm (which refers to any type of cells, not just papules). A bigger papule is called plaque. A neoplasm can be benign (not cancer) or malignant (cancerous that spreads). Postule: A postule is an area on the skin that is filled with pus. 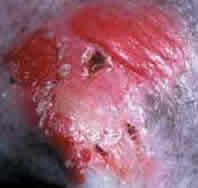 Pus is caused by white blood cells that are sent to kill a foreign invader such as bacteria or a fungus. The dead cells create a lump on the skin called a postule. Vesicle: This is a lump underneath the skin that is filled with an unusual amount of fluid (called edema). Wheal: A wheal is a raised area that tends to heal by itself in minutes or hours. It is an area with increased redness or has a pale color when compared to surrounding areas. It is also referred to as a cat hive with symptoms such as severe itching. Common causes include certain foods or drugs, infection, insect bites or allergy. Nodule: A nodule is a larger elevated bump on the skin. Causes include an abnormal cell growth (neoplasm that is benign or malignant). It can also be caused by bacterial or fungal infection. Tumor: A tumor is a large tissue mass. It is caused by abnormal cell growth (neoplasm that is benign or malignant) or due to some type of inflammation. 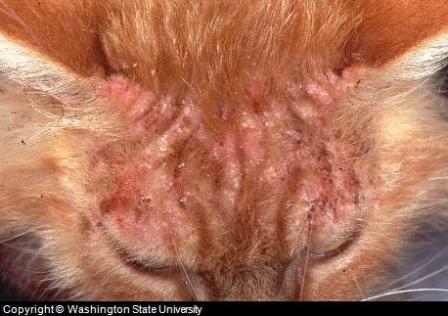 Feline Miliary Dermatitis: Collection of small bumps in a red areas of skin. There are multiple causes. If you can't match one of the picture, try continuing your investigation by clicking the links below that best match the cat skin symptoms, or what you believe is causing the cat skin problems. Cat skin cysts - these are usually benign (non-cancerous) lumps under the skin that can be found anywhere on your cats body. Feline cysts are often drained and removed if they are making a cat uncomfortable. Secondary complications include infection. Feline Skin Allergies Symptoms such as hair loss and skin dermatitis (inflammation) seen in the back half of the body, and on back legs. Can also be generalized or all over. Cause by either atopy (allergens in the air such as pollen, called atopic dermatitis), or food allergy. 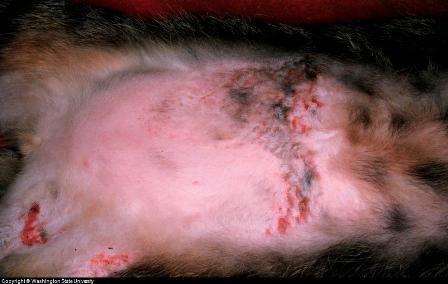 Cat atopic dermatitis in particular is the second most common cause of feline skin conditions after flea allergy (see below). Symptoms are similar to flea allergy so if you cat has been on a flea preventative, then atopy should be the next area to investigate. The condition is usually treated with a prescription steroid such as the medication prednisolone. If any skin rubbing resulted in infection, then antibiotics will be prescribed as well. Fleas: Cat flea allergy dermatitis (also called flea bite hypersensitivity) is the most common cat skin problems. It is more difficult to diagnose in cats than dogs. There is a wide variety of cat flea allergy symptoms, including the use of their teeth and tongues to scratch the skin. Often, cat owners believe that this is over grooming when in fact a cat is suffering from a flea allergy. Another sign of cat flea allergy is when a cat licks the belly until a hairless spot forms. If the feline flea allergy dermatitis is severe, the cat may chew a stripe of fur away from the spine and shoulder down to the rear. Miliary dermatitis refers to cat skin problems where scabbing lesions form in areas under the chin and neck. Even a few cat fleas can result in skin problems on the back half of the body, or all over the body. Problems are also often seen above the tail. It can be difficult to find the fleas since cat fur is thick and fleas tend to hide near the skin. Even if your cat stays indoors, fleas can be brought into the house on your shoes, or the shoes of your visitors. They can also be spread by other pets. This is why all cats and pets in a home need to be on flea preventatives such as Frontline Plus® and Advantage®. Avoid off-brand products such as Pet -Armor®. Even though these have the same active ingredient as Frontline, the concentrations could be delivered in a different medium and therefore possibly be less effective (ask your veterinarian for the best product to use for your cat). Treatment includes killing all fleas, and then using a flea preventative. During recovery, improve hair condition with a homeopathic (see bottom of page) and Omega Fish Oil Supplements. Ringworm: (also called dermatophytosis) Ringworm in cats is less common than cat flea allergy or atopic dermatitis. This fungus occurs in cats with inadequate immune systems, which is a particular problem in kittens whose immune systems haven't had time to develop. Cat ringworm symptoms include hair loss and crusting on the paws and face. Some cats can be carriers of the disease without showing any symptoms, which could explain why one cat in a two cat household has the disorder. Treatment options include a natural skin treatment such as Naturasil. Physical Examination: Some types of cat skin disease such as fleas are immediately identifiable by your vet. such as fleas. Skin Cytology Tests: The next most likely cause is a cat skin infection caused by bacteria. Cytology tests are used to examine skin cells in order to confirm this specific diagnosis. Fungal Culture Test: This test is used to detect fungal infections such as cat ringworm. Results take 2 to 3 weeks, so the test is often given at the first office visit just in case. A special lamp called a Woods Lamp is also used as an in-office diagnostic test for certain types of cat fungal skin infections. 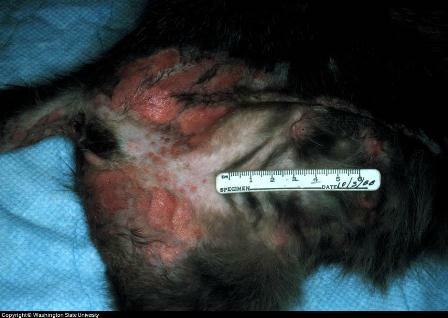 Skin biopsy: These tests look for problems such as cat skin cancer. In this test, a needle is used to remove cells from a lump to be examined by a pathologist. This can determine if a lump is cancerous or if it is just a cyst or wart. Food Trial: Food allergy is a common cause of allergy in cats. If this cause is suspected, then the vet will recommend a hypoallergenic diet . Blood and Serum tests: These tests can be used to check for infections, certain nutrient deficiencies and allergens (serum tests). Intradermal tests (skin surface tests) can also be used to test for certain allergens that are causing atopic dermatitis (skin inflammation), after other possible causes are eliminated. There are also problems that are unique to kitten skin. The treatment of the diseases and conditions associated with feline skin problems depends on the exact disease or condition. 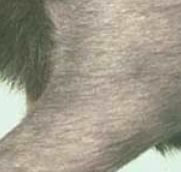 If the cat skin condition is mild, meaning there is mild skin itch or skin flaking, then you can try home treatment. First, look for an early stage cat flea problem. Even if you don't see fleas in your home or on your cat, don't immediately eliminate this as a possible cause since fleas are great at hiding. Also, contrary to popular belief, fleas are one of those cat skin problems that can occur at any time of the year. To check for cat fleas, use a flea comb and comb through your cat's coat, with special focus on the area just above the tail and also be sure to carefully examine the back part of the thighs. If you suspect cat fleas, you'll want to kill the fleas that are on your cat using a product such as Adams Plus, followed by the use of a flea preventative. If this is the cause be sure to also clean your cat's environment to remove any hiding fleas. Check with your Vet for a specific product recommendation as well. Next, if you rule out fleas as the cause of the cat skin problems, you can try bathing your cat in a colloidal oatmeal shampoo such as Avoderm or use over-the-counter sprays or waterless bath foam (if your cat hates baths) to see if you can bring some relief. These are not cures, but can help with symptoms. Avoid using medicated shampoos at first, as these can often irritate the skin. If the natural shampoos don't help, then a medicated cat shampoo is worth a try (see below). The key to shampoo therapy is contact with the skin, which isn't always easy with a cat that hates the water. The ideal length of time for a shampoo to stay in contact with the skin is 10 minutes. If you cat allows it, massage into the skin, and then rinse the shampoo off your cat for 5 to 10 minutes. If the non-medicated approach does not help, try these shampoos depending on the symptoms and suspected cause of the condition. Bacterial cat skin Infection, Fungal infection. If you notice the cat skin condition worsening, despite your home treatment, see a Vet. 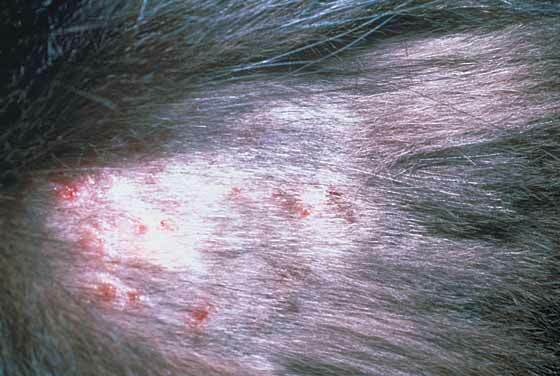 Always see a Vet if you see hair loss, red skin areas, pus or oozing areas on the skin. Also, if your cat has scratched herself too much, antibiotics may be necessary, as a secondary bacterial infection may have set in. Treatment may involve oral or topical medications. Treatment may also involve surgical removal of any lumps or bumps from your cat’s skin. This is usually only done if the growth is cancerous or if it seems to be bothering your pet. If it is benign and is not causing your cat discomfort, it can be left alone. There are several over the counter homeopathic products that could help to improve overall skin and coat condition such as Skin and Coat Tonic. Other over the counter products such as Dermasol contain Vitamin A, which can help to promote the healing of skin.